Several countries are increasingly relying on immigration as a means of coping with domestic shortages of health care professionals. This trend has led to concerns that in many of the source countries – especially within Africa – the outflow of health care professionals is adversely affecting the health care system. This paper examines the role of wages in the migration decision and discusses the likely effect of wage increases in source countries in slowing migration flows. This paper uses data on wage differentials in the health care sector between source country and receiving country (adjusted for purchasing power parity) to test the hypothesis that larger wage differentials lead to a larger supply of health care migrants. Differences in other important factors affecting migration are discussed and, where available, data are presented. There is little correlation between the supply of health care migrants and the size of the wage differential between source and destination country. In cases where data are available on other factors affecting migration, controlling for these factors does not affect the result. At current levels, wage differentials between source and destination country are so large that small increases in health care wages in source countries are unlikely to affect significantly the supply of health care migrants. The results suggest that non-wage instruments might be more effective in altering migration flows. Several countries are increasingly relying on immigration as a means of coping with domestic shortages of health care professionals. The movement of health care personnel across international borders is nothing new. However, less-developed countries are now the main source of health care migration flows into many developed countries. This trend has led to concerns that in many of the source countries – especially within Africa – the outflow of health care professionals is adversely affecting the health care system and, in turn, the health of the population. As a result, decision-makers in source countries are searching for policy options to slow down and even reverse the outflow of health care professionals. Migration decisions are influenced by a broad range of social, political, professional and economic factors. Several of these factors are beyond the control of policy-makers within the health care sector, but it is well demonstrated that employment prospects are a key factor affecting the migration decision of health care professionals. An often-discussed policy option in source countries is to increase the wages of health care professionals to encourage them to stay in the country. Unfortunately, little information is available on the likely success of such initiatives. In this paper, we examine the available evidence on the relationship between wages and desire to migrate, focusing on doctors and nurses in less-developed countries. The central focus is the effectiveness of increasing domestic wages to reduce the willingness of health care professionals to migrate out of developing countries. Specifically, after briefly describing migration trends we ask two questions: i) How important are wages to the migration decision compared to other factors? ii) How likely is it that higher wages in source countries can reduce the desire to migrate? Given the lack of convincing evidence, we suggest further research in key areas. Several developed countries are currently experiencing a shortage of nurses . Shortages are reported to be particularly severe in Canada, the United Kingdom and the United States of America, and these countries are increasingly relying on nurses from the developing world to fill vacancies. For example, of the approximately 16,000 new nursing registrants in the United Kingdom in 2002, over 50% were from abroad. By contrast, only 25% were from abroad in 1998. The five main source countries in 2002 were Australia, India, Philippines, South Africa and Zimbabwe . In the USA, the number of foreign-trained nurses applying for licensure – a proxy measure of inflow into the USA nursing labour market – has increased steadily over the past few years moving from about 6,000 in 1998 to over 8,000 in 2001. The main sources are Africa (mainly Nigeria and South Africa), Canada and the Philippines. 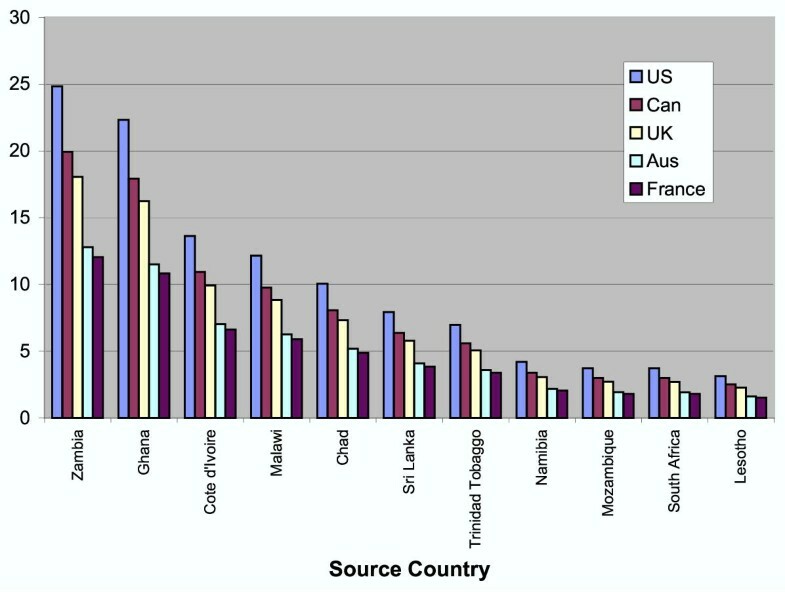 It is much more difficult to obtain data on the outflow of health professionals from source countries. Nevertheless, where data do exist they confirm the upward trend in migration flows indicated by the inflow data from receiving countries. For example, about 4,500 nurses left the Philippines in 1996, compared to over 12,000 in 2001. One third went to the United Kingdom. In South Africa in 1995 there were 511 requests for verification of nursing credentials – a proxy measure of intent to leave the country. By 2000, however, there were over 2,500 requests – a remarkable five-fold increase in five years. The trend in the inflow of foreign physicians differs among the main destination countries. The proportion of foreign-trained physicians has increased slightly over the past 20 years in the USA . Data from England suggest that this might also be the case in the United Kingdom, although the increase is very small. In Australia and Canada, however, the proportion of foreign-trained physicians has decreased quite considerably. The composition of the migrant physician stock in destination countries has changed over the past few decades. Developing countries are now the main source of migrant physicians in several developed countries. For example, 20% of migrant physicians in the United Kingdom are from Africa. In the USA, 30% of migrant physicians are from India and Pakistan. In Canada, one-third of migrant physicians are from the United Kingdom, but 10% are from South Africa . Out-migration of health care professionals from developing countries is becoming a serious concern for several reasons. 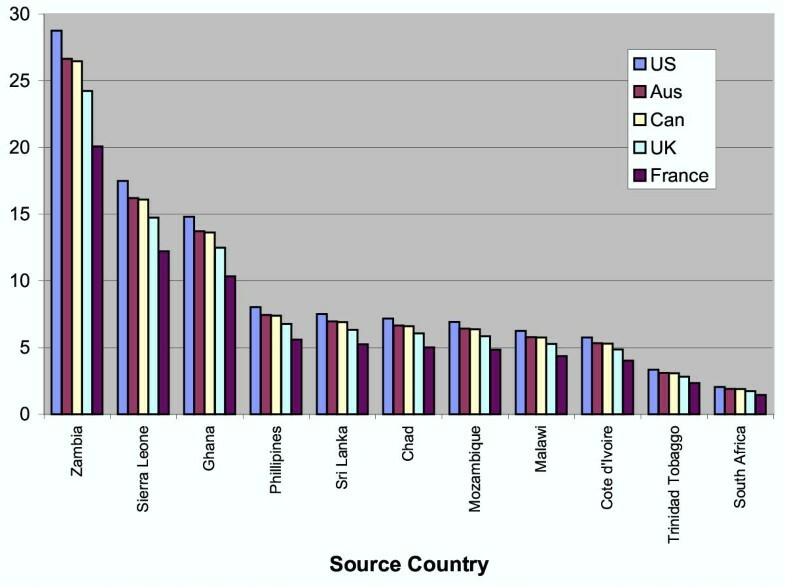 First, these countries already have very low stocks of health care professionals. As a result, small absolute losses – 10 or 50 physicians, for example – might be very large relative to the size of the medical workforce. Second, educational capacity in most developing countries is not large enough to support both increased out-migration and increased domestic supply. In Zimbabwe, for example, there were 737 graduates from nursing programmes in 2001. In the same year, 473 nurses left Zimbabwe to work in the United Kingdom alone. It is not known how many migrated to other destination countries. In 1997, however, only 26 nurses migrated to the United Kingdom and 422 people graduated form nursing programmes. Similarly, 1,200 doctors were trained domestically in the 1990s and of this graduate cohort only 360 remain in Zimbabwe today . Africa, in particular, has limited educational capacity. Of the six WHO regions of the world, Africa has the lowest number of medical schools per population. The case of nurses in the Philippines is the obvious exception. The Philippines has for many years trained more nurses than are required to replenish the domestic stock, in an effort to encourage migration and increase the level of remittances flowing back into the country. But many health care providers in the Philippines have recently argued that the level of out-migration has become so large that there is actually a shortage of nurses in the Philippines. Third, source countries in the developing world have very poor health outcomes and are most in need of the services that health care professionals produce . It is particularly troubling that out-migration is increasing in these countries. The level of out-migration from any source country depends on the supply of migrants, the demand for migrants and the mechanism through which supply interacts with demand. For any source country, the supply of migrant health care professionals can be defined as some measure of the number of health care professionals who wish to leave that country and migrate abroad. The demand for migrant health care professionals from any source country can be defined as some measure of the number of health care professionals from that country that all receiving countries are willing to accept as immigrants. The interaction of the supply of and demand for migrant health care professionals – the "market" – will determine the actual level of out-migration from any source country. Each of these concepts is described in further detail. The supply of migrants depends on a complex set of social, economic and political factors. Among the many variables that influence migration decisions, wages have been shown to have an important impact . Analysis of the supply of migrants is further complicated by the fact that migration is often a family decision, not that of just an individual. For sake of simplicity, in this paper we treat the migration decision as individual. Where C is the direct financial cost of migration, W f and W d are the foreign and domestic wage, respectively, and Z is the compensating differential in favour of staying in the source country. The compensating differential captures all non-wage factors that are important to the migration decision. It will vary across individuals but, on average, will be positive. This simply means that all else equal, individuals prefer to remain in their home country. Where J represents "working conditions" – non-wage job characteristics people value, such as safety, lack of stress, opportunities for advancement, prestige, housing or transportation – and C is the financial cost of migration expressed in utils. According to this specification, the compensating differential includes all factors other than wages, working conditions and direct moving costs that might influence an individual's attachment to his home country. These factors – collectively referred to as "living conditions" – can be divided into country-specific and individual-specific components. The country-specific or national components (N) would include such factors as crime rates, availability of schools for children, language spoken and the availability of clean water in the source and destination country. The individual-specific or personal components (P) would include such factors as presence of family, patriotism and the size of a person's social network in the source and destination country. Both of these categories include observable and non-observable factors. The supply of migrants is an increasing function of the foreign wage and foreign working conditions and a decreasing function of the domestic wage, domestic working conditions and direct moving costs. The supply of migrants is also a decreasing function of the compensating differential (N + P) so that an improvement in domestic living conditions is expected to decrease the supply of migrants, all else equal. 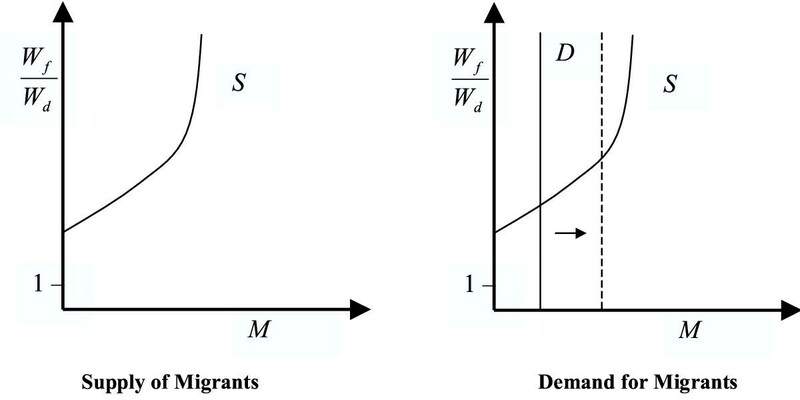 The relationship between wages and the supply of migrants is summarized by the supply curve depicted in Fig. 1. The relevant price is the ratio of the foreign wage to the domestic wage – the "wage premium". The relevant quantity is some measure of intent to migrate such as the number or fraction of the health care professionals wishing to migrate (M). Further, if marginal utility with respect to income is diminishing – as is commonly considered the case – then beyond some high premium level, theory predicts that the supply curve will become very steep. If this is the case empirically, then in this range of the wage premium, altering the premium will have little impact on intent to migrate. If the compensating differential is positive (i.e. people prefer to remain in their native country, all else equal), and direct moving costs are positive – both reasonable assumptions – then wages in the source and destination country do not have to be the same in order for the supply of migrants to be zero. 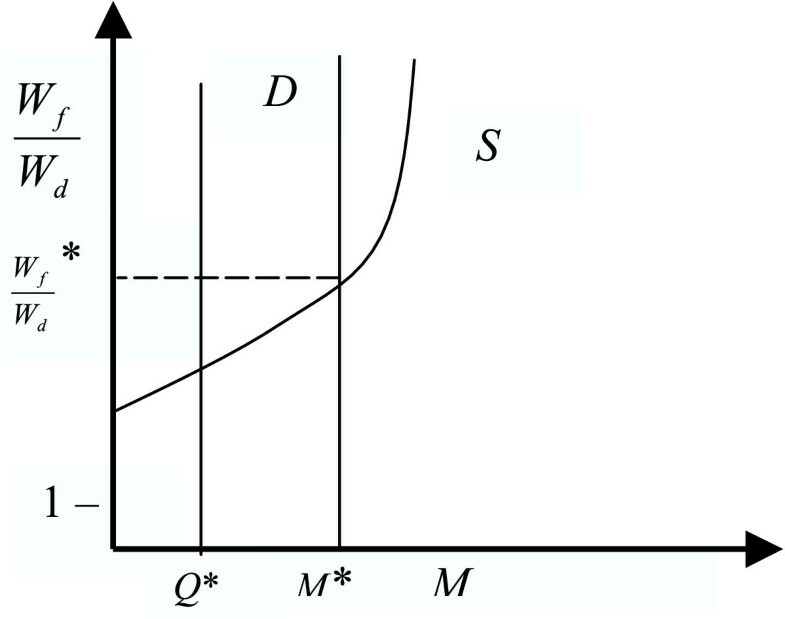 This is illustrated in the graph with a supply-curve intercept greater than one. The only purpose of this basic model is to illustrate in a simple way that there are different policy options available in source countries to decrease the desire among health care professionals to out-migrate. First, the domestic wage can be increased. This is represented in the model as a movement along the supply curve. It is clear that the effectiveness of this option depends crucially on the elasticity of supply at the relevant premium level. Second, working conditions can be improved. This would shift the supply curve to the left. Finally, living conditions can be improved or direct migration costs can be increased. This would also be represented by a leftward shift in the supply curve. In general, the living conditions of a country are exogenous to the health care sector. Improving economic conditions, lowering crime, improving housing and schooling, making people believe in "a future", etc., are policy options that must be executed at higher levels of leadership. Thus, working conditions and wages in the health care sector are the most feasible policy levers. The demand for migrant health care professionals on the part of destination countries depends on several factors, many of which are outside of the health care system. Immigration policy is driven by political factors, concerns for security, domestic birth rates, the state of the economy and war (both at home and abroad), to name a few factors. Nevertheless, it is well documented that in the main destination countries, labour market conditions have an influence on the number of migrant professionals allowed into the country [7–9]. For example, until recently, Canada maintained a list of occupations within which employment vacancies were evident. Potential immigrants working in one of these occupations would have a much higher chance of being granted entry than if they worked in a non-listed occupation. In the USA, certain visa categories have been created to allow persons with certain qualifications to enter the USA more easily. The health care sector is no different. For example, based on a report in the early 1990s in Canada, the government took the view that there were too many physicians in Canada. As a result, in addition to decreasing medical school enrolment the government lowered the number of physicians admitted into the country from abroad. There are large numbers of unfilled vacancies for nursing positions in Australia, Canada, the United Kingdom and the USA [1, 10, 11]. These nursing shortages are so large – and are forecasted to grow at such a rate – that many believe current domestic training institutions simply cannot produce enough nurses to remedy the situation. This is due to several factors. Many claim that nursing requirements will increase in the near future due to population ageing and technological advancements in medicine. Concerning population ageing, however, there is little evidence to support such a claim . In terms of the capacity to produce more nurses within the main destination countries, population demographics are changing so that there are simply fewer young people [10, 13]. This means that the pool of candidates for nurse training programmes is decreasing. Furthermore, educational institutions in Canada and the USA have been under fiscal pressure over the past decades and have reduced enrolment, although recently this trend has been reversed. Nurse training programmes have also increased in length and nursing is no longer the prestigious profession that it once was. Young women now have more career options and as more enrol in engineering, information technology and commerce programmes, fewer enrol in nursing . Even if domestic institutions within destination countries were able to produce enough nurses and physicians to fill vacant positions, health care professionals from abroad are often viewed as a less costly substitute, since governments in source countries underwrite education costs. This is especially relevant in the current climate of health care cost containment that is apparent in the main destination countries. The actual degree of substitutability between a domestically trained health care professional and a migrant is open to some debate. It is expected to increase as training programmes in developing countries grow more and more similar to those in the main destination countries. However, some argue that domestic programmes are tailored to the specific health care needs of the country and that foreign-trained medical staff do not provide the same quality of care. The majority of nursing programmes in Bangladesh, the Philippines and South Africa, for example, are based on curricula from United Kingdom or USA nursing schools, and classes are held in English. Many provinces in Canada keep a list of designated countries where medical training is thought to be equivalent to that of Canada. In some provinces it is incorporated into legislation, while in others, licensing bodies are permitted to use their discretion. The overall situation for physicians does not appear as severe as for nurses. However, shortages are evident in some regions, most notably rural areas. In Canada, the United Kingdom and the USA it is increasingly difficult to recruit and retain domestically trained physicians in rural areas. Migrant physicians, however, seem quite willing to take up these remote postings and recruitment campaigns are often focused on filling rural vacancies . Shortages are also evident in some medical specialties. Several recent reports have highlighted increases in the number of unfilled vacancies in certain specialties as well as in rural areas in Canada and the USA [16, 17]. Some governments are reacting by fast-tracking foreign-trained specialists through certification or domestic licensure processes . As a result of these trends, the demand for migrant nurses and physicians in Australia, Canada, the United Kingdom and the USA is thought to have increased over the past few years. 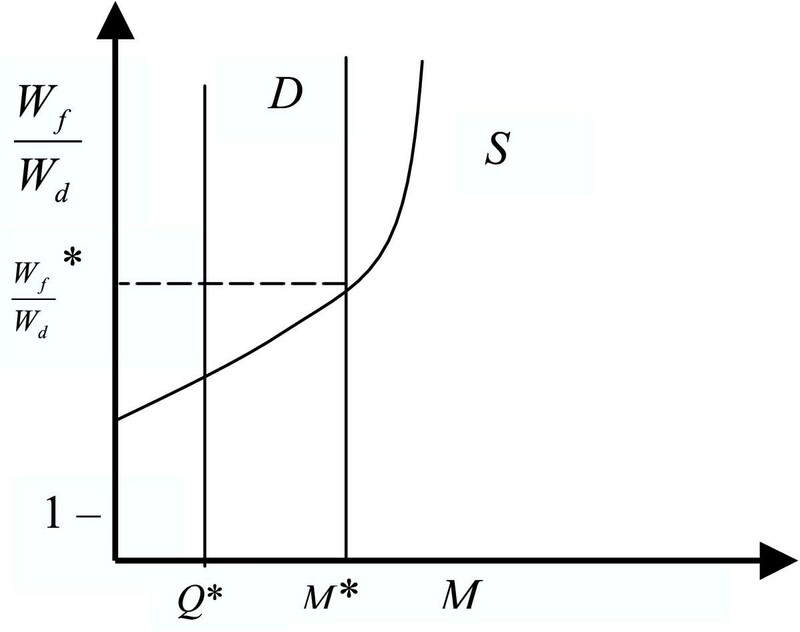 In the supply and demand framework, this increase is represented by a rightward shift in the demand curve depicted in Fig. 1. Note that the demand for migrant health care professionals is independent of the wage premium. This reflects that although the demand for health care professionals in destination countries might be sensitive to health care wages, the demand for foreign health care professionals, per se, is not expected to be. It is unlikely that the labour market for migrant health care professionals is in equilibrium. This is for several reasons. Health care wages in the public sector – where most health care professionals are employed – are often set through some form of collective bargaining. These agreements typically last two to three years, during which wages are not negotiable. Furthermore, wages in the health care sector tend to be closely linked to the broader public sector wage structure. As a result, factors outside the health care labour market often lead to changes in health care wages. Wages for migrant health care professionals in destination countries might be more flexible than health care wages in general. This might happen if, for example, migrant health care professionals worked mainly in the private sector in destination countries where employees are not covered by collective bargaining agreements. But even if wages were perfectly flexible, the equilibrium flow of migrant health care professionals (M*) might not be feasible, due to constraints on migration flows. This is illustrated in Fig. 2. As noted earlier, while migration policy is sensitive to labour market conditions, it depends on a host of other factors. For various reasons, destination countries often set quotas on the total number of immigrants admitted into the country each year and the quota must be divided across several occupations other than health care and, in some cases, countries. Thus, there could be a quota on the number of health care professionals allowed into the country (Q*) that is binding. The fact that the labour market for migrants is not in equilibrium has important policy implications. If there is an excess supply of migrants in a source country – i.e. the number of health care professionals willing to leave the country is greater than the number destination countries are willing to admit – then any sort of supply-side policy will have little or no impact on actual migration flows. This is because the flow is constrained by the demand for migrants in destination countries. Of course, supply-side policies in source countries (e.g. raising domestic wages, improving working conditions) will affect intent to migrate, but this is likely to have no impact on actual flows. On the other hand, in situations where there is an excess demand for migrants, raising domestic wages or improving working or living conditions will reduce migration flows. To get an idea of the relative importance of the factors affecting willingness to migrate, it is useful to examine some survey data from health care professionals in source countries. In 2003 the World Health Organization Regional Office for Africa published a report on the migration of health care professionals in six African countries . A total of 2,364 health care professionals – mostly nurses – within these countries were asked whether they intended to migrate and where, what the main reasons were for wanting to migrate, and what factors would encourage them to stay in their home country. In some cases health care professionals who had already left their home country and were living in a destination country were surveyed. Table 1 summarizes some of the survey results. The most popular responses are listed, as well as the percentage of health care professionals giving the particular response. It is clear that wages are an important factor affecting the supply of migrants but they are not always the most important factor. Fringe benefits, particularly housing and automobile allowances or provision, are also prominent on the list within Africa. For what reasons do you intend to leave your home country? For what reasons did you leave your home country? What would make you remain in your home country? These data are useful in that they offer insight into the list of factors affecting the willingness of individuals to migrate and point to wages as being an important variable. However, they do not provide any information on the actual size of the wage gap between source and destination countries or the elasticity of the supply of migrants with respect to the domestic-foreign wage gap. For this, one must examine differences in health care wages between source and destination countries. Table 2 presents average monthly wages for physicians and nurses for selected countries around the world. The table is divided into countries that are mainly a source of migrant health care professionals and countries that are typical destinations. Wages of nurses and doctors have been converted to USA dollars at purchasing power parity and thus represent cost-of-living adjusted wages that can be compared across countries. Relevant to the migration decision is the difference between the wage in the source country and destination country. This difference – the "wage premium" – is represented as a ratio and appears in Figs. 3 and 4. Wage differences, even after adjusting for differences in the cost of living, are large. Even in high-wage source countries health care salaries are still about one-third the level of Australia, Canada, France, the United Kingdom and the USA. The large variation in health care wages both within destination countries and between source countries can be exploited to provide some insight into how sensitive the supply of migrants is to wage differentials. The first strategy is to use the variation in wages across destination countries. For each source country, the wage premium for nurses is largest in the USA and smallest in France and the United Kingdom. For doctors, the wage premium is largest in the USA and smallest in Australia and France and the variation across destination countries is much larger than for nurses. If the supply of migrants is sensitive to changes in the wage premium, then one would expect nurses who wish to migrate to prefer the USA over France and the United Kingdom as a destination. Similarly, one would expect doctors who wish to migrate to prefer the USA over Australia and France. Of course, such an inference is valid only if people in source countries perceive migration costs, working conditions and living conditions to be roughly the same in all five destination countries. To the extent that language is an important component of living conditions, this is definitely not the case with France. However, among the four English-speaking destination countries this may not be such an unreasonable assumption. The survey of health care professionals in Africa provides some information on preferred destination countries. Those who intended to migrate were asked to which country they intended to migrate. The ranking of responses is provided in Table 3. There is no distinct pattern of preference for the USA over other countries as a destination. Moreover, Canada never outranks Australia, France and the United Kingdom, even though for physicians the wages in Canada are considerably higher. These data could suggest that the elasticity of the supply of migrants with respect to the wage premium is close to zero in this sample of countries. Again, such an inference is based on the assumption that perceptions of migration costs, working conditions and living conditions are similar among the five destination countries. If such an assumption is invalid, then nothing can be concluded regarding the elasticity of supply from this strategy. In fact, studies have found that the presence of immigrants in destination countries who come from the same country, city, or village has a very large impact on the preferred destination of migrants. These "network effects" have been found to be as important as, if not more important than, wages and other factors [20, 21]. The second strategy is to use variation in wages across source countries. As Figs. 3 and 4 show, the nurse wage in Australia and Canada is about 25 times the nurse wage in Zambia, about 14 times the nurse wage in Ghana and about twice the nurse wage in South Africa. The physician wage in the USA is about 25 times the physician wage in Zambia, about 22 times the physician wage in Ghana and about 4 times the physician wage in South Africa. If the supply of migrants is sensitive to changes in the wage premium, then one would expect source countries with the lowest wage premiums to have a lower supply of migrants than countries with the highest premiums. Of course, this inference is valid only if migration costs, working conditions, and living conditions are roughly the same in all source countries. For now, we hold to this assumption. Ideally one would want to compare intent to migrate across all countries where wage data are available. Unfortunately, there are only two countries where data on both intention to migrate and the wage premium are available: Ghana and South Africa. Despite the lack of data, one advantage is that data are available for two extreme cases. In Ghana the average wage premium for nurses and doctors is about 12 and 15, respectively. In South Africa it is only about 2 for nurses and 3 for doctors. As Fig. 5 shows, there is no significant difference between intention to migrate among health care professionals in Ghana and South Africa . It would be interesting to examine the wage premium in Uganda – the country with the lowest supply of migrants – to see whether the premium is below the level of South Africa. Reliable data on health care wages in Uganda, however, are for now unavailable. Assuming that migration costs, working conditions and living conditions are roughly the same in Ghana and South Africa, the fact that equal proportions of health professionals want to migrate out of Ghana and South Africa implies that the wage elasticity of the supply of migrants is close to zero for this range of premiums. Such an inference brings important policy implications. If the supply of migrants is not sensitive to changes in the wage premium in the range observed, then increasing health care wages in Ghana – even by substantial amounts – is not expected to affect significantly the proportion of health care professionals wishing to leave. Obviously, migration costs, working conditions and living conditions are not the same in Ghana and South Africa. However, according to the model, if these factors are to explain the similarity in intent to migrate between Ghana and South Africa, living and working conditions in Ghana would have to be superior to those in South Africa. Alternatively, migration costs in Ghana would have to be higher than in South Africa. Unfortunately, such data are difficult to come by. Where data are available, results are mixed and it is difficult to conclude whether working conditions and living conditions are more favourable in Ghana. For example, health care professionals were asked a series of questions concerning workplace safety and HIV. The results are summarized in Fig. 6. Health care professionals in South Africa seem more satisfied with protective measures against HIV, yet they experience more stress and worry. One possible explanation is that health care professionals in South Africa are more aware of the dangers associated with HIV/AIDS in the workplace compared to those in Ghana and therefore are more concerned. This might be due to the sheer volume of HIV/AIDS cases in South Africa and the number of health care professionals infected. 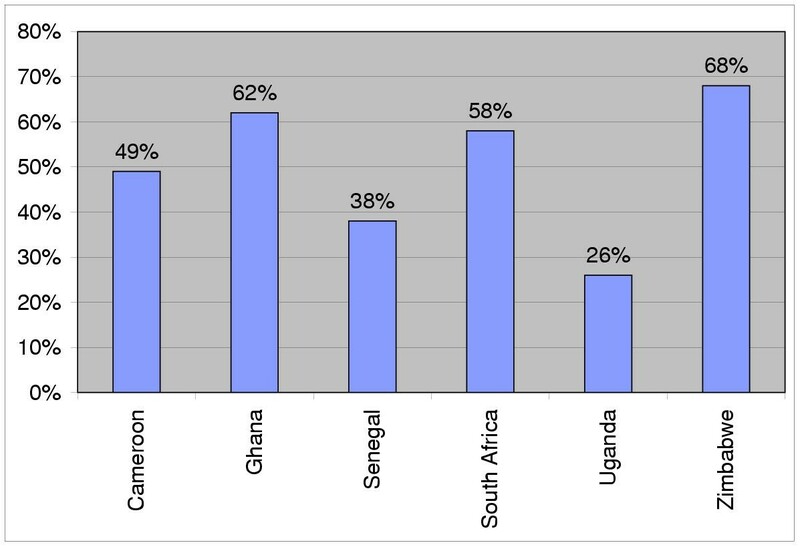 Health professionals in Ghana reported higher levels of dissatisfaction with managerial support and availability of adequate facilities at work than health professionals in South Africa. On the other hand, they were also much more satisfied with workload levels than their South African counterparts . In terms of living conditions, South Africa actually outranks Ghana in most aggregate measures. For example, GDP per capita in 2001 was USDPPP 11,290 in South Africa and 2,250 in Ghana. The literacy rate in Ghana is 73% compared to 86%. The Human Development Index – an overall measure of societal conditions – was 0.56 in Ghana in 2001 and 0.68 in South Africa . Survey results also seem consistent with these objective measures of living conditions. For example, 71% of health professionals intending to migrate indicated poor living conditions as a reason, compared to only 15% in South Africa . There are several other components of working and living conditions that are important to the migration decision for which it is impossible to have data. Nevertheless, where data are available they seem to suggest that living and working conditions in Ghana are not superior to those in South Africa. If anything, the opposite may be true. Data on migration costs is unavailable, but it is difficult to imagine why migration costs in Ghana would differ from migration costs in South Africa. Therefore, these limited data are consistent with the hypothesis that for the range of wage premiums observed, changes in the premium will have little impact on the supply of migrants. In other words, health care wage increases in source countries – unless very substantial – will not decrease the willingness of health care professionals to migrate out of these developing countries. We caution that this interpretation is based on, in essence, estimation of a supply curve using only two data points. Unfortunately, until reliable wage data become available that can be matched to the surveys of intention to migrate, this analysis cannot be pushed much further. There are, however, several other interpretations of the data. South Africa tends to be a "holding ground" for health care professionals throughout Africa who intend to migrate to Canada, the United Kingdom and the USA. That is, health care professionals from African countries who intend to migrate abroad first move to South Africa, work for a year or two and then migrate to developed countries. South Africa has favourable arrangements with certain destination countries. For example, a registered nurse in South Africa who migrates to the United Kingdom immediately gains full registration status and does not have to pass a probationary period or complete additional training. Gaining work experience in South Africa also increases the likelihood of being offered employment in the United Kingdom and the USA, making it an attractive temporary work environment for health care professionals from all over Africa. As a result, intent to migrate among health care professionals in South Africa might be higher than in Ghana even if the wage premium, migration costs, living and working conditions were to be identical in the two countries. This situation is illustrated in Fig. 7. If this is true, then the available data cannot be used to estimate the wage elasticity of supply. 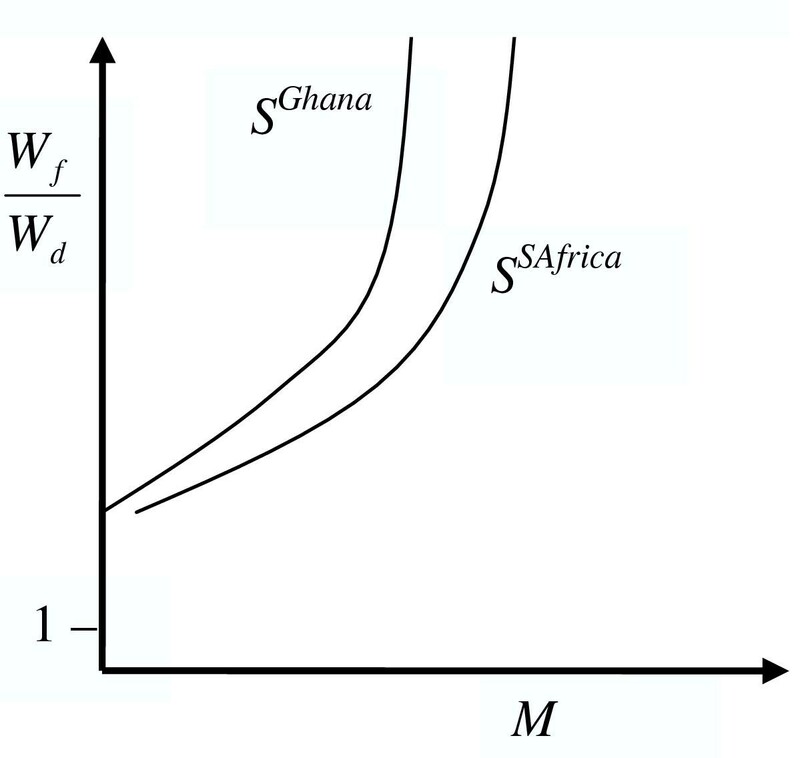 In essence, the data then represent two separate points on two different supply curves, making it impossible to draw any conclusions concerning the elasticity of the supply of migrants. Unfortunately, it is difficult to collect data on temporary migrants and there is no way of testing the extent to which this biases the results of the analysis. Finally, it is useful to compare the interpretation of these results to previous research on the relationship between wages and migration in developing countries. Some of the most recent estimates of the impact of wage differentials on migration flows is found in Hatton and Williamson  and Clark et al. . They find that in a sample of 21 African countries, a 10% increase in the foreign-domestic wage ratio increases out-migration by between 1 per 2,000 population and 1 per 1,000 population. Furthermore, the wage ratio itself explains much of the variation in immigration patterns within Africa. However, as with most studies in the existing literature, these studies are not necessarily comparable to the results in this paper. First, most of the literature examines migration flows between countries that are geographically close. Second, and more significantly, the magnitude of wage differences examined in the existing literature is much smaller than the differences in health care wages between developed and developing countries. Thus, most of the existing literature can be thought of as estimating the wage elasticity of the supply of migrants for a completely different part of the supply curve than is examined in this study. It appears that the willingness of health care professionals to migrate from developing to developed countries is somewhat unresponsive to wage differences between source and destination countries at current levels. However, we caution that this conclusion is valid, at best, in source countries where the difference between health care wages at home and abroad is of the same magnitude as in countries examined in this paper – between 3 and 15 times. The current lack of, among other things, regularly available information on health care wages in developing countries limits the strength of the conclusions that can be drawn on the relationship between wages and the supply of migrants. To improve the quality of analysis, we believe that in addition to improving the accuracy of data it is necessary to go beyond administrative data and to analyse the experiences of countries where retention reforms have been implemented. Currently, the World Health Organization and its partners are pursuing both of these strategies. If wage increases in source countries are not likely to decrease the supply of migrant health care professionals, as suggested by these results, then what is? One alternative is to improve working conditions and living conditions in developing countries. However, just as with wages, little is known about the responsiveness of willingness to migrate with respect to these variables and further case study analysis is needed to identify best practices. Finally, this paper has focused on the role of wages in decreasing the supply of migrants. But policy-makers must keep in mind that the labour market for migrant health care professionals is unlikely to be in equilibrium. This implies that migration-flows out of developing countries could very well be demand-constrained. If this is the case, then altering the supply of migrants might have little impact on actual migration-flows out of developing countries. Policy-makers wishing to decrease the outflow of health care professionals from developing countries would then have to focus their attention on demand side policies. These could include such things as tailoring training programmes in developing countries to domestic needs, encouraging developed countries to increase their training capacity and making destination countries pay some form of compensation to source countries – policies sometimes requiring the cooperation of destination countries. That developed countries seem to have no problem recruiting foreign-trained health care professionals suggests that, in fact, the migration of health care professionals is demand-constrained. The topic, however, deserves further research. M. Vujicic performed the statistical analysis and prepared the manuscript. All authors participated in interpreting the results, and read and approved the final manuscript.